Brewing ale in Neolithic Britain - it seems to be a controversial topic among some academic archaeologists. I'm not sure what the problem is with malting and brewing ale in the neolithic era. It could be that few people understand the processes involved in the transformation of grain into malt, wort and ale. If you have come to this page via the BBC Earth website, or from the Stone Pages, please be aware that the comments attributed to me there are wrong. I have no idea where they came from, other than as a misunderstanding. I hope for a correction in the near future but so far I am not having much success. Roasted malts, also known as specialty malts, are a feature of modern industrial malting. I'm working on a blog about that at the moment and will post a link to it when I have completed it, hopefully before the Yule celebrations of 2016! 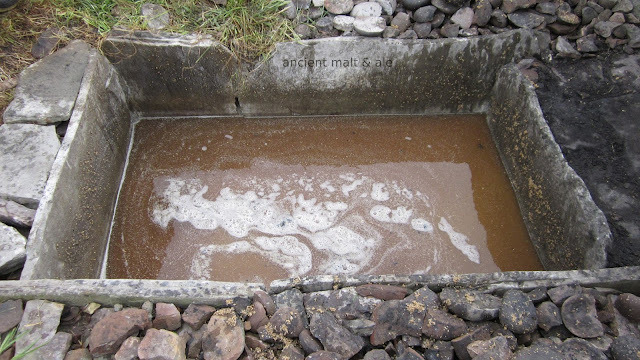 The last few posts have been about explaining the saccharification in the mash tun, where the crushed malt, when mixed with water and gently heated, is converted by enzymes into malt sugars. I've also written a little about lautering, sparging and how to collect the wort. Firstly, alcoholic fermentation requires anaerobic conditions. A large vat (1000s of litres) within a building has a blanket of carbon dioxide over the fermenting beer, as in lambic brewing. A small trough (100s of litres) situated outside would have this blanket blown away. Secondly, during fermentation, the little bubbles of carbon dioxide produced by the yeast, stick to the smaller particles and lift them into the froth of the barm. You can see the towering barm in the picture below. It can turn into a really messy monster when it has a lot of little bits in it. After fermentation you would still have the problem of straining or filtering what brew has not been lost to the froth-over. That is a lot harder with little bubbles in it. A bed of husks will not form properly and filtering just doesn't work. Once the brewer has obtained a quantity of wort by mashing, lautering and sparging, the next stage of the brewing process is the fermentation. Whether you mash in a large pot, a wooden tub with a spigot hole, in a trough in the ground or in a modern mash tun, the wort that you make must be dealt with promptly to prevent infection setting in. Wort does not keep well. Either you boil it, as is necessary with hops, and then cool and inoculate with yeast at the right temperature. Or you can inoculate a fresh wort when it has cooled, and then add the herbs. We found that meadowsweet flowers inhibited the yeast and are better added after the fermentation. To find out more about raw ale which, basically, is beer made from an unboiled wort, I suggest a look at this blog. Raw ale is a huge topic in itself. 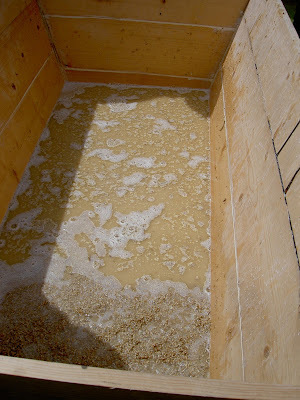 There are a number of ways of adding the yeast to the wort to start the fermentation. Today, the brewer can add yeast directly, in dried form or as a yeast starter, when the wort temperature is just right. Many modern breweries keep their yeast starter in a fridge. They scoop some of the barm (foam) from the top of the fermenting beer and then store it in a cool place until required. 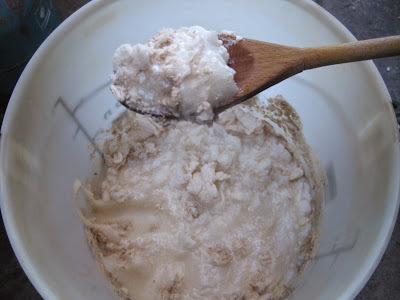 The yeast culture can be kept and used for several months. Brewers in history and prehistory could also have used this simple and basic technique, keeping their barm/yeast culture in a cool place. 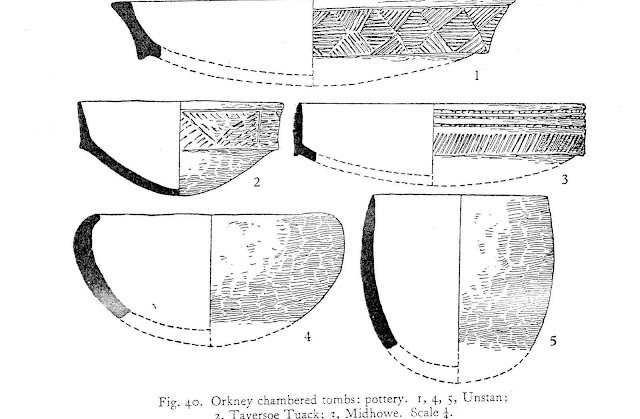 In the 1980s, archaeologists found a medium sized grooved ware pot which had been sunk into the ground in the remains of one of the buildings at Barnhouse, Orkney. The pot, about a litre in volume, had been buried up to its' rim. Analysis revealed that it had contained some kind of 'cereal based mixture', but they were unsure about the pot's function. I think it may have been a barm pot. It was located in a large building, numbered eight by the excavation team and interpreted as a 'temple' or some other kind of ritual building. There were drains as well as many sherds of broken or smashed Grooved Ware pottery, representing pots of about one litre in volume. There was also evidence of feasting and what archaeologists refer to as 'ritual activity', although what that was is not made clear in the excavation report. I would say that if an archaeologist is looking for a prehistoric ritual activity then the mysterious and magical transformation of grain into malt, wort and ale is well worth considering. In Norway, Lithuania, Latvia and other places, the tradition of making farmhouse ale survives, with brewers passing on their skills, techniques and knowledge to their descendants. Old traditions of inoculating the wort are still practised in several areas of northern Europe. The picture below shows a wooden yeast ring or kveikering being used to inoculate a yeast starter. Some sources say that the tradition of the kveikering dates back to the 18th century, although I wonder whether the concept might date even further back. It's difficult to be sure because, of course, a wooden object used to gather yeast and start a fermentation would not survive in the archaeological record. In the Viking era, apparently, a stick was used to stir the fermenting wort. This would put yeast onto the stick. Then, if it was kept dry, it could be used to start the next fermentation by stirring a fresh wort. In the Western Isles of Scotland there is a tradition of stirring the fermenting beer with a hazel stick (or wand) which is then hung up to dry and used to stir the next batch of wort, to begin the fermentation. We did some experiments using a wooden spoon and found that this technique works perfectly. Big pots as fermentation and storage vessels. The neolithic era was the time of the 'first farmers'. The earliest grain agriculturalists of the British Isles (c4000BC onwards) were also the megalith builders. They created magnificent stone circles and henges as gathering places for the community. They built stone tombs for their dead and they began to settle down. Associated with the 'first farmers' is the integrated 'cultural package' of grain cultivation, the management of domesticated animals (cows, sheep, goats and pigs) and the manufacture of ceramics. This was the 'neolithic revolution', a different lifestyle to the mesolithic hunter gatherers who had roamed the land for thousands of years previously. At this time in prehistory, the technology for making large stave built wooden vessels (vats, tubs, barrels) did not exist. 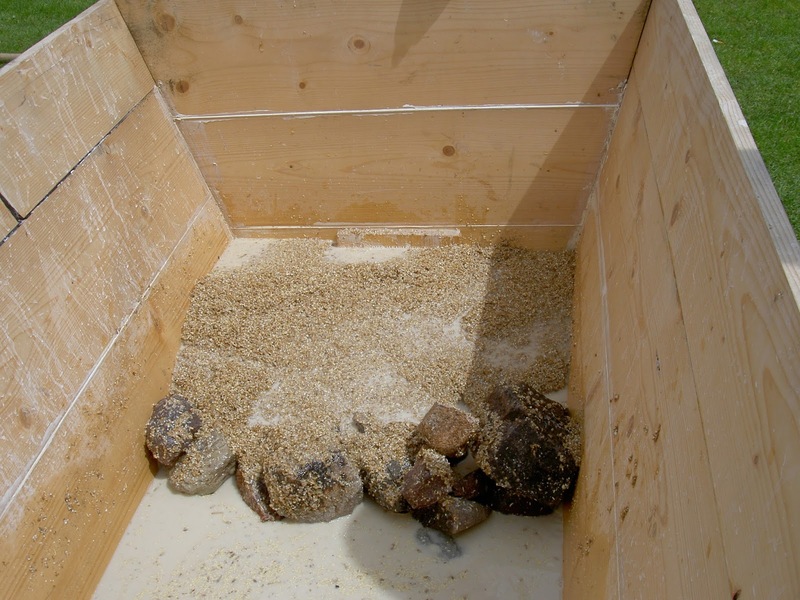 How did these neolithic 'first farmers' process their grain? Were they grinding it into flour, to make bread? Were they boiling it, making some kind of gruel or porridge? Or were they making ale from it, by malting, mashing, sparging and fermentation? For some reason, the possibility that such a thing as ale in the neolithic is considered to be a controversial idea by many archaeologists. I'm not sure why. Some of the large neolithic Grooved Ware pots might have been used as fermentation vessels. They are perfect in both shape and size. One particularly large Grooved Ware pot found at the neolithic village of Skara Brae, Orkney, was around 30 gallons in volume. Most of the large Grooved Ware pots were around eight to ten gallons. They are found at many ritual and feasting sites of the neolithic, in domestic contexts, for example at Skara Brae, Orkney, and at stone circles and henge monuments throughout the British Isles. What is Grooved Ware? It is neolithic pottery that archaeologists have defined by its' decorative pattern of grooves and shapes on the exterior. Not all grooved ware has grooves; some of it has fancy applied decoration, with blobs of clay and raised patterns. 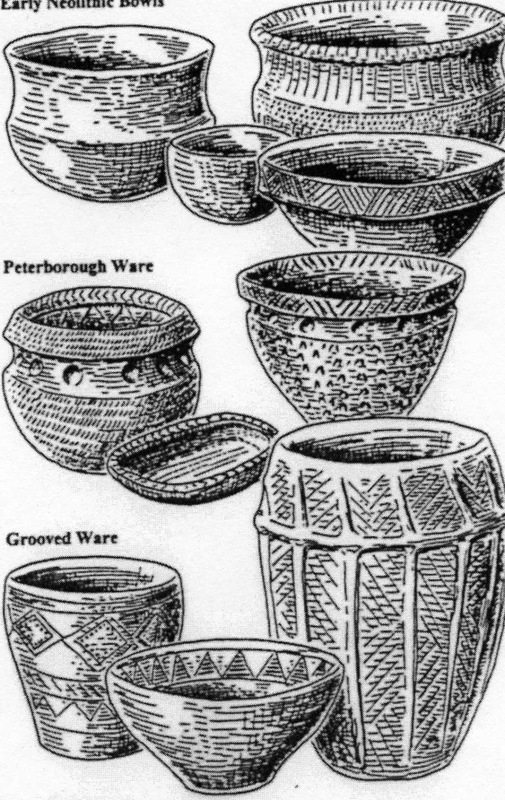 Most Grooved Ware pots are bucket shaped, with a flat bottom. They are found throughout the British Isles, from Clacton to Orkney and Shetland and also in Ireland. Indeed, this style of pottery was first called 'Rinyo-Clacton Ware'. Rinyo being the name of a site on one of the Orkney islands, Rousay. It was a neolithic village larger than Skara Brae. 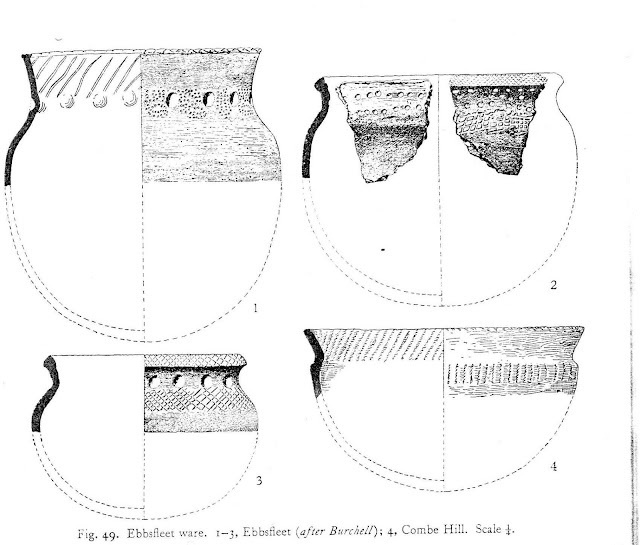 Grooved Ware was also found on the south coast, at Lion Point near Clacton. 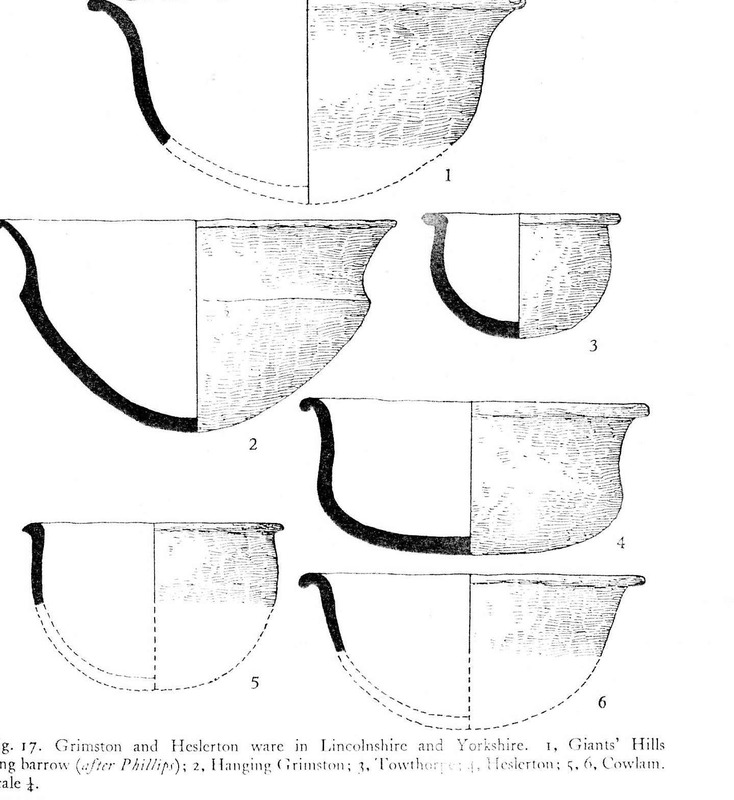 Here's one of Stuart Piggott's beautiful and classic drawings of British Neolithic pottery, showing what some of the Grooved Ware pots from the south coast probably looked like, based upon sherds found during excavations on the Essex coast, at Lion Point. Pottery is frequently found during archaeological excavations. Archaeologists regard it as diagnostic. The discovery and identification of a sherd of pottery gives them a good clue about the date of the site. 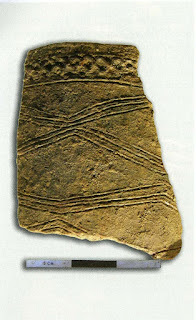 Neolithic and Bronze Age pottery was not glazed. It could have been waterproofed in several ways, by burnishing or by being sealed with fats, beeswax or milk. 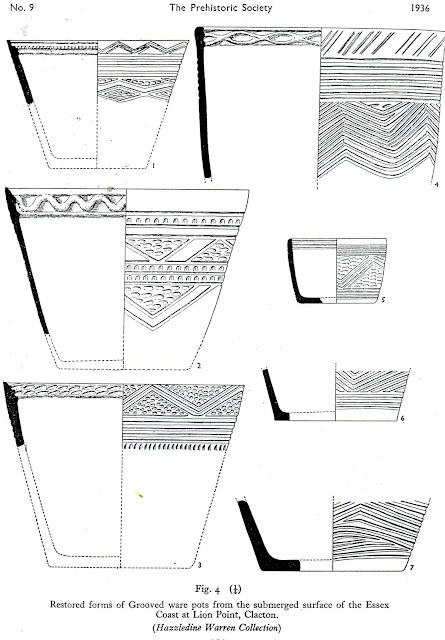 Pottery typologies are complex. It's an enormous area of archaeological study and I could not possibly go into every style and type of British Neolithic pottery in this blog. We would be here forever. There's Windmill Hill, Grimston-Lyles Hill Ware, Ronaldsway, Grooved Ware, Unstan Ware, Peterborough Ware, Ebbsfleet and so the list goes on. Most are round bottomed pots, with the exception of Grooved Ware. It took me many months to get to grips with these stylistic categorisations that have been imposed upon pottery of 5000 years ago. Many bowl shaped pots are interpreted as 'cooking pots'. That seems fairly reasonable. What puzzles me is that whenever archaeologists find a very large pot, or the sherds of a large flat bottomed bucket shaped pot, it is almost always interpreted as a 'storage pot'. I have not yet come across a large pot from the British Neolithic that has been interpreted as a potential fermentation vessel, although some of them have a volume of several gallons and such large pots are often found at feasting sites, for example, at Durrington Walls, near Stonehenge. If an earthenware pot is to be used to contain any liquid it must be waterproofed. We discovered, in our mashing and fermenting experiments, that beeswax worked very well as a sealant, as did butter and lard. As a control experiment we tried fermenting mead in an untreated earthenware pot. The fermentation worked well, the room filled with the smell of mead, and the outside surface of the pot was covered in little beads of sticky sweetness. But the final product was disappointingly low in alcohol. It turns out that the alcohol diffuses through the porous pot much faster than the honey solution. This makes an untreated pot pretty useless for creating an alcoholic drink. 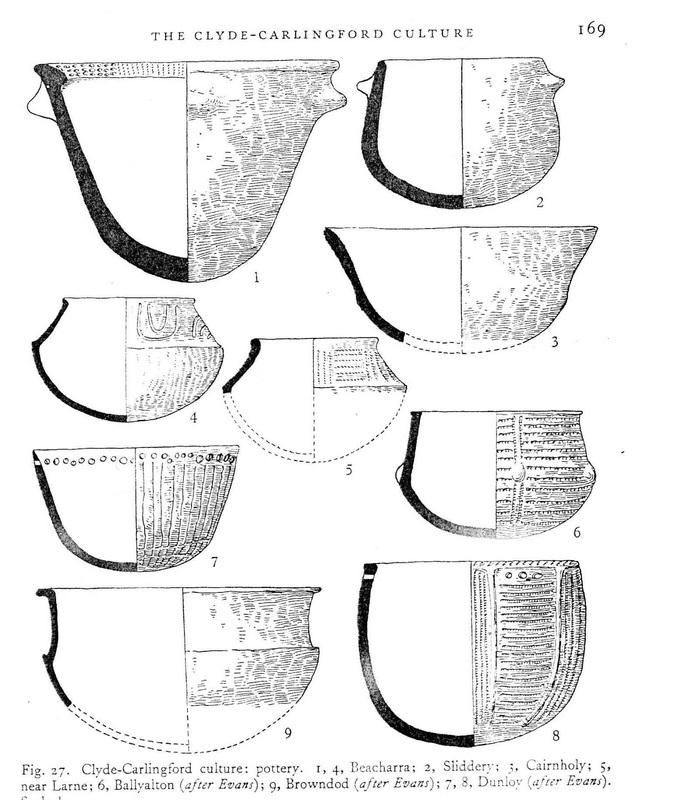 Here is a sample of some of the British Neolithic pottery types, as recorded by Stuart Piggott. You can see that there is a wide range of styles. Some have holes in the rim, to secure a covering or lid of, perhaps, leather. Some are deep, others are wide and shallow. I prefer to look at these pots with function in mind, rather than consider only their decoration and style. Is there any archaeological evidence for the use of large pots for the fermentation or storage of barley wort? One of the very best indicators that a pot was used to ferment wort into ale, or for storing the ale, is the identification of beerstone on the internal surface. Beerstone precipitates out of a fermenting barley wort, it looks rather like eggshell. We have a lot of it accumulating on our plastic fermentation buckets and storage vessels. It takes many hundreds of uses to accumulate a visible deposit of beerstone, but it is a certain proof of fermented wort. Brewers using plastic pipes in breweries often have to clean them of an accumulation of beerstone. It clogs the pipes. 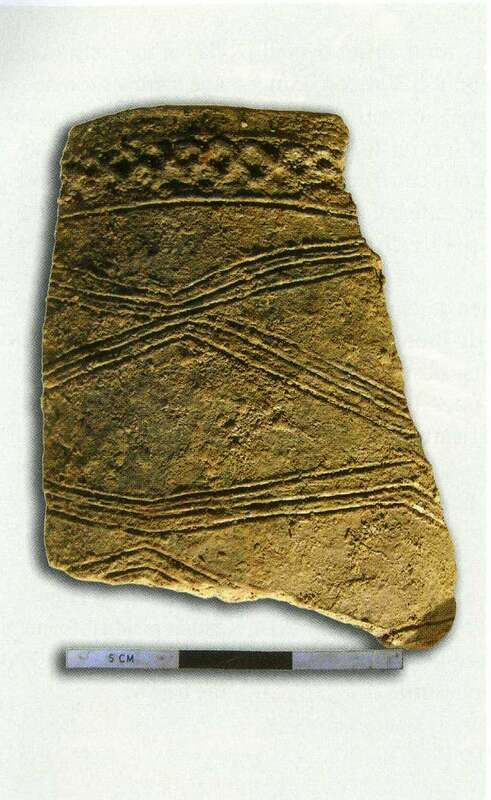 Beerstone has been identified on pots from a Bronze Age site in the Zagros mountains of modern day Iran. At excavations at Godin Tepe a great many pots and jars were discovered, they were stored in the University of Pennsylvania Museum. Subsequent analysis of a yellowish deposit on the internal surface of jars identified beerstone and it is generally accepted as unequivocal evidence for beer brewing. This pioneering paper by Badler, Michel and McGovern, published in 1993, tells the whole story and contains sufficient detail to be able to repeat the tests for beerstone on prehistoric pottery. I wonder whether any archaeologists in the UK or Europe would consider looking for beerstone on big prehistoric pots? Maybe it is already being investigated. It would be great if this could happen, since this might end the apparent controversy about whether or not a big old pot was used for the fermentation of beer made from a barley wort. If you would like to make your own kveikering, here is some more information and details of how to make one. Brewer Martin Warren of the Poppyland Brewery was so impressed by the idea that he made his own. My conference paper from 1996 "Neolithic Ale: Barley as a source of sugars for fermentation" can be downloaded from my Academia page, here. How do you collect the wort when you have mashed in a trough in the ground? The main problem, obviously, is that you can't lauter and sparge in the same way that you would if you had used a wooden tub as a mash tun with a spigot, or if you had a bespoke lautering and sparging vessel. When the trough is in the ground, it's a different story. There are thousands of sites throughout the British Isles that archaeologists know as Burnt Mounds. All that remains is a large pile of fire cracked stones and the remains of a trough lined with either stone or wood. If you have never heard of burnt mounds before, I suggest you have a look at an earlier blog which explains what they are and some of the interpretations. Archaeologists agree that they were used to make water hot. This was achieved by heating rocks in a fire then putting them into the trough of water. What you do with that hot water is up to you. There are many possibilities. Some interpretations include bathing, others suggest cooking meat and some archaeologists think that they were used as a sauna. Another function is as a mash tun. 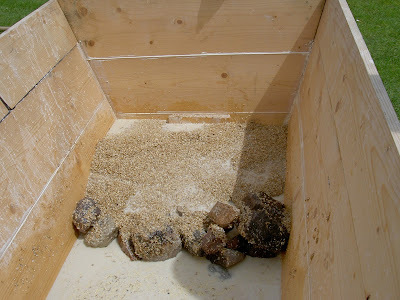 With the discovery of chaff and grain in an oak trough excavated in Wales in 2008, a mash tun is a strong possibility. 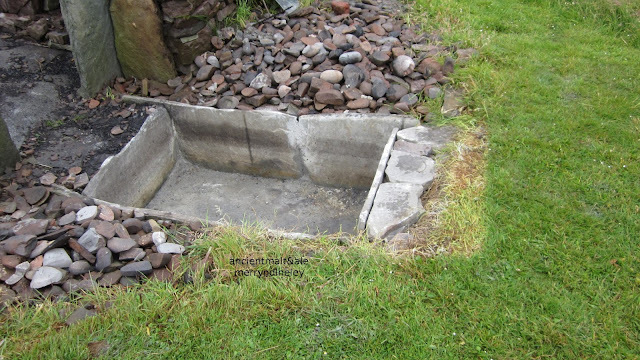 Replica trough at Bressay, Shetland, surrounded by fire cracked stones . A few years ago, we mashed in a full sized replica stone trough, based on the one from the Bronze Age burnt mound site on the island of Bressay, Shetland. The original trough and buildings were moved stone by stone, since it was in danger from coastal erosion. A replica trough and hearth was built beside the Bressay Heritage Centre, for experimental archaeological work. 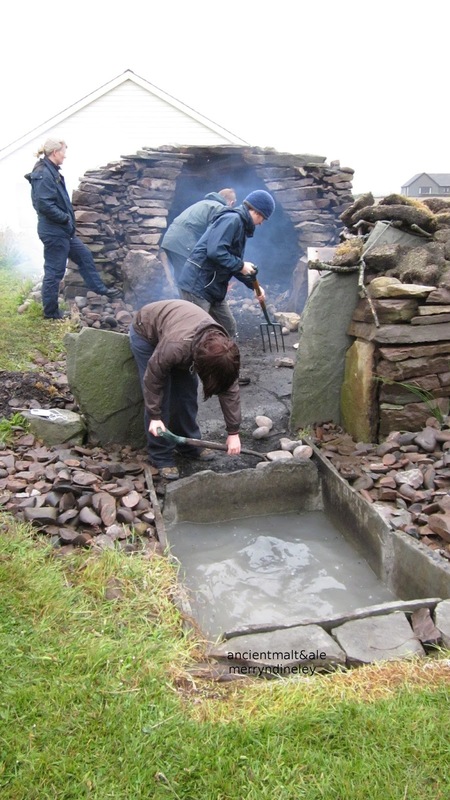 It's been used to dye wool, it has been used as a bath and also as a mash tun by archaeologist Dr Lauren Doughton in her experimental work. We were there in the summer of 2011 to mash some malt with her when she was working on her PhD about burnt mounds and troughs. The weather was rough, even though it was mid July. Buffeted by the wind and rain, we managed to run a mash and collect some of the wort. Our time was strictly limited because we had to catch the last ferry off the island and get back to our tent. A full set of pictures of the day's mashing, collection of wort and the final brew can be seen here on my Facebook page. Brewers usually want to obtain as much wort as they can from the mash. There is potential for lots of waste from a trough mash unless you can find a way of maximising the wort extraction. The most obvious technique might be to let the grain settle to the bottom of the trough, then scoop the wort out using a jug or a bucket or something like that. It's tricky, as we discovered. Nevertheless, it works. Inevitably there will be bits of husk in the wort. This is not a problem. They will sink to the bottom again and it is easily possible to obtain a clear wort for fermentation from a trough mash. 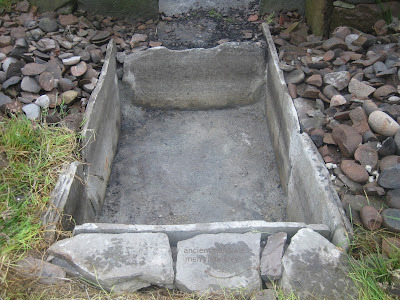 Locally sourced clay was used to seal the corners of the replica trough before we began the mash. Water was put into the trough. 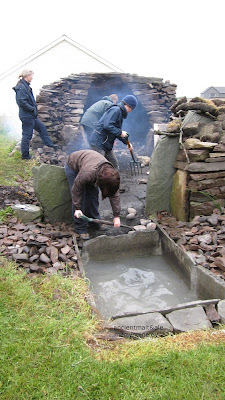 It became slightly murky, a grey colour from the clay luting that we had used to seal the trough. We were a bit worried, however, we did not need to be concerned because the resulting ale from this experiment was delicious, sparklingly clear and bright, perhaps the result of our accidental addition of clay to the water. The hot rock rolling team, from the fire into the water. The technique of rolling hot stones from the fire into the trough of water had been perfected by Lauren and her team in previous runs. Using garden forks and spades, the hot rocks were expertly rolled down the slope and into the water. When the water reached strike temperature, 50 kilos of crushed pale malt was added to the 200 litres of water and stirred with a garden fork. You know when the water is the correct temperature for the strike, around 74 degrees Centigrade or thereabouts, because this is when you can clearly see your reflection in the water, no ripples, no steam. We double checked with a thermometer. The strike:adding the crushed malt to hot water. The saccharification takes about an hour and it's crucial to keep the mash temperature right for that time, adding hot rocks and stirring as necessary. We put a wooden board over the trough, to help keep the steam and the heat in. It was a good conversion of starches into sugars, a successful mash. The finished mash, when settled, was a deep dark brown and it tasted very sweet. The finished and settled mash - the next job is to collect the wort and ferment it. For non brewers, I should emphasise that wort is not alcoholic. 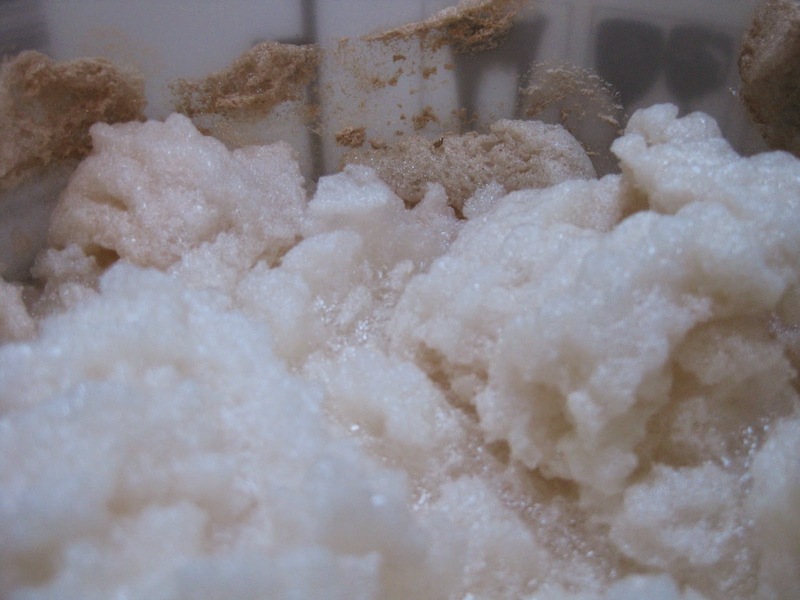 Sugar ferments into alcohol, starch does not. The saccharification that happens during the mash is a crucial part of the beer brewing process. Fresh wort is very sweet and prone to all kinds of bacterial and fungal infections. On the three occasions when we have been too tired to process the mash after a demonstration, the next morning the mash was fizzy and sour. Wild yeasts and lactic bacteria infections had ruined it. It was useless. Wort must be collected as soon as it is cool enough to take the yeast. The yeast ferments sugars into alcohol. Herbs or hops preserve and flavour the ale or beer. We were short of time and collected as much wort as was possible. 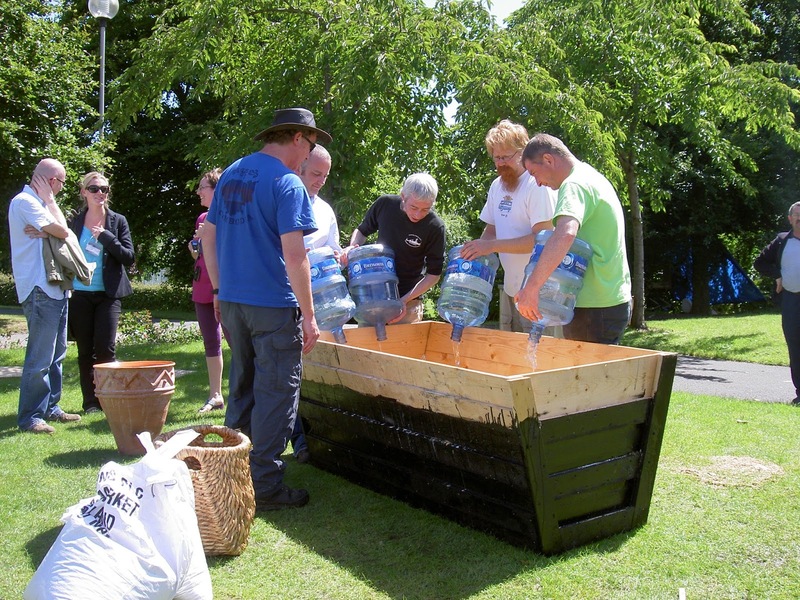 The brewer used jugs, buckets and plastic containers to scoop from the trough. We had, of course, taken the stones out first, when they were cool enough to handle. 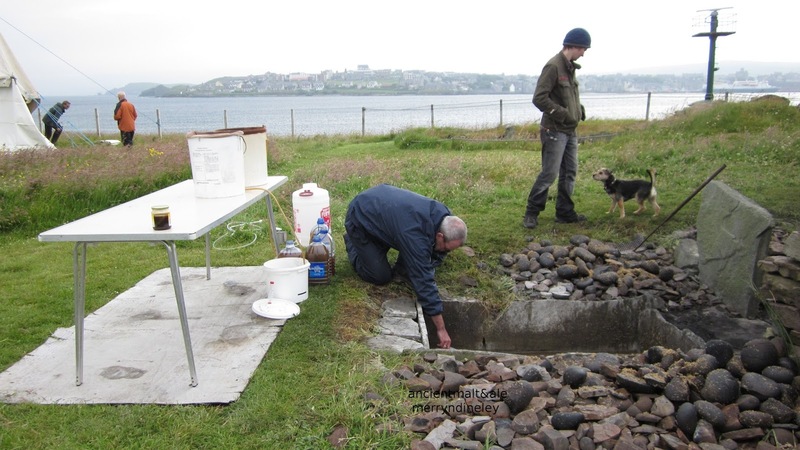 The process of collecting the wort was hard work and we only managed to get about 6 gallons out of the trough before we had to pack up, load the van and catch the last ferry back to the Shetland mainland. The brewer collects wort from the trough. The stones have been removed and are on the heap. The wort was put into a fermentation vessel, yeast was added and the fermentation vessel was kept warm using sleeping bags as insulation. After about four or five days it had fermented into a fine, clear and strong ale. We used a handful of dried meadowsweet flowers as a preservative. On the ferry back to mainland Shetland we realised that we had made a mistake. 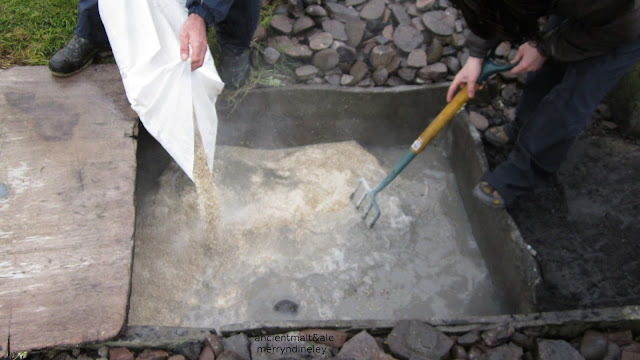 We should have piled the stones up in the trough to make a sort of dam, then we could have put the mash to one side and the wort would have been so much easier to collect. This is how the Moore Group archaeologists collected the wort at their trough mash demonstration at the Sixth World Archaeology Conference in Dublin, 2008. 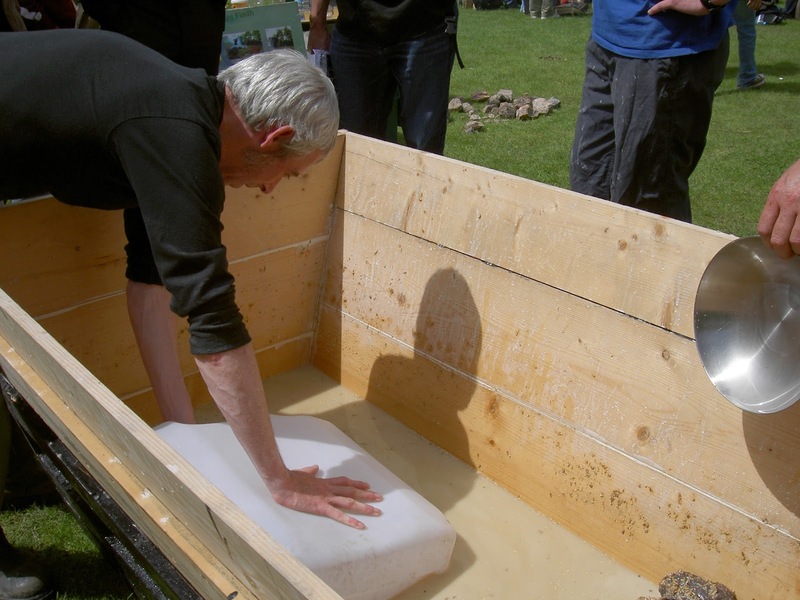 They made a wooden trough and painted the bottom part with bitumen to ensure that it did not leak. They correctly assumed that the University authorities would not allow them to dig a big hole and set their trough in the ground. They heated the stones on a fire, dropped them into the water and added the crushed malt when the strike temperature was right. 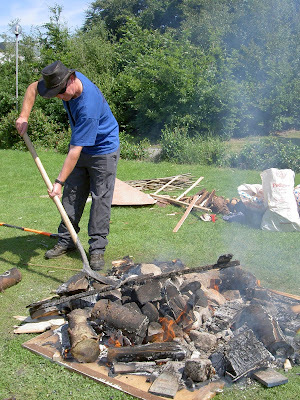 It was this hot rock mashing demonstration that inspired us to stop mashing in pottery vessels and start using troughs, wooden tubs and hot stones. 6 collecting the wort, it's cloudy because it has been stirred up. Hot rock mashing is a spectacular process, the stones sizzle as they hit the water, the mash saccharification happens right before your eyes and the aroma from the mash smells delicious. This is a mysterious, magical transformation from grain starchiness into fermentable sweetness. Surely this would have been an event that would have amazed and impressed people in prehistory, just as much as it does in modern times. Collecting the wort like this, by creating a dam of stones, is an extremely efficient way of doing it, perhaps even allowing for sparging. Once the first runnings have been collected from the trough, more hot water can be poured gently through the mash, thus releasing more wort for the brewer. There would be very little waste and a good quantity of wort could be collected. Is there any archaeological evidence for the collection of wort like this? It is rare that prehistoric troughs are excavated with the stones still within them. If you have excavated one like this, I would love to hear about it. Excavations in 2013 by Wessex Archaeology at Kingsmead Quarry, Horton, in Berkshire, England revealed the remains of four neolithic buildings. They were interpreted as having been 'houses', which is often the case with these discoveries. I do wonder how many of these neolithic 'houses' might have been used as barns or as buildings where the grain was stored and processed. But that's a story for another blog. One of these four neolithic rectangular timber buildings at Horton caught our attention when we were looking at the pictures online. There appear to be some fire reddened rocks close by one of the buildings, in a heap. The buildings are, as always, interpreted as "houses". But were they dwellings? Or some other kind of building, like a barn or grain processing building? See Wessex Archaeology's page about them here. The red rocks look rather like modern bricks. There seems to be no mention or discussion of them on the web page. Maybe I missed it. However the stratigraphy indicates that they are contemporary with the building. So, are these stones an indication of hot rock water heating technology at neolithic Horton? Were they piled up in a wooden trough that has long rotted away? What were the people doing in and around this rectangular wooden building, over 5000 years ago? I cannot answer these questions. I am nevertheless intrigued by this discovery. 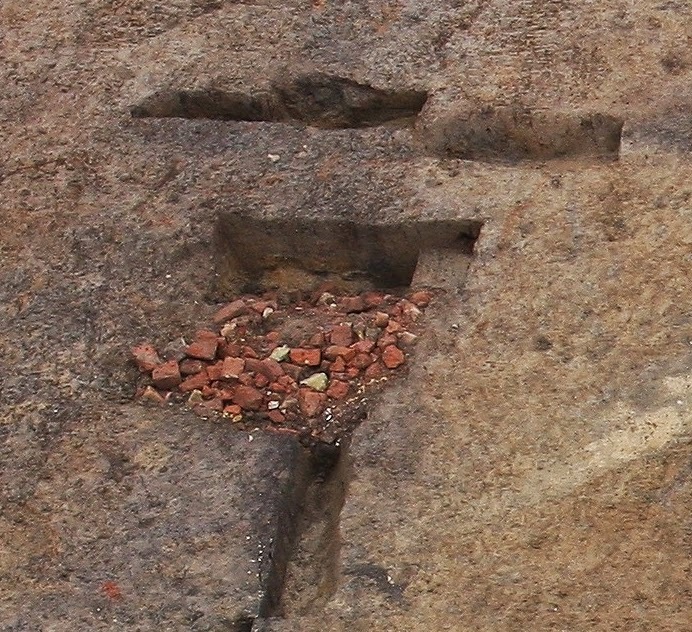 And so I finish this blog with a close up (thanks to Graham) of those mysterious fire reddened stones and welcome interpretations, comments and discussion. If you want to know what our Bronze Age Trough Ale, with meadowsweet, tasted like, we sent some to David Connolly of BAJR (British Archaeological Jobs & Resources). Although he struggled to open the parcel, he gave his opinion on the ale's flavour and strength. It is sometimes said that prehistoric ale was weak, cloudy and sour and that it tasted disgusting. We disagree.